I’ve been pretty completely quiet on the blog front for the last year. A lot has happened – I submitted my thesis in June 2012, passed my viva in August and graduated in December. In July last year I started work as the Outreach Officer for the Institute of Cosmology and Gravitation at the University of Portsmouth and am currently spending all my free time trying to decide how much astronomy and physics I can incorporate into my wedding later this year! Still, I’ve got a few new projects in the pipeline that should hopefully mean I’ll start blogging a bit more again. 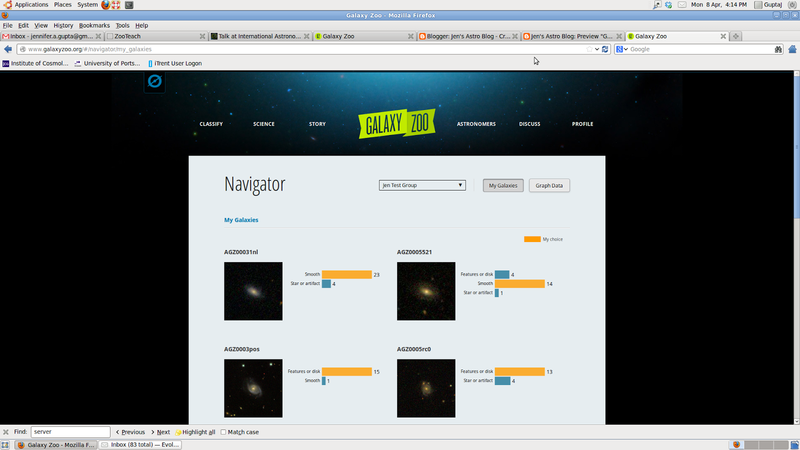 The reason for this post is really just to have somewhere to post some pictures of a new tool that is now available for Galaxy Zoo users. 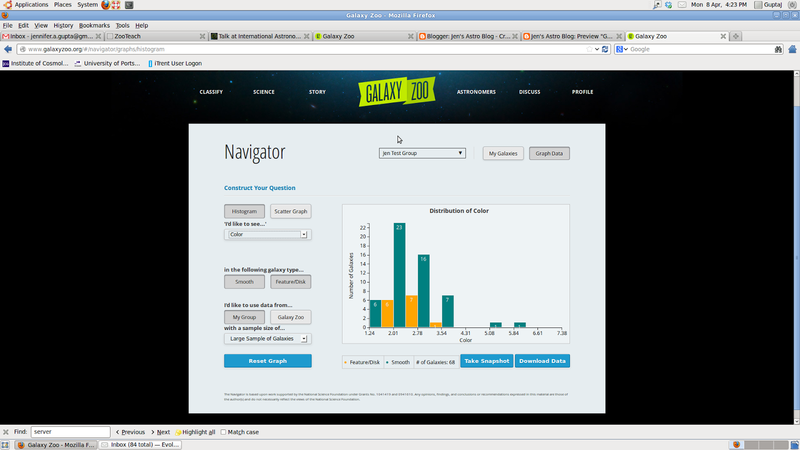 The Navigator tool allows users to classify galaxies in a group and then investigate their classifications in more detail. 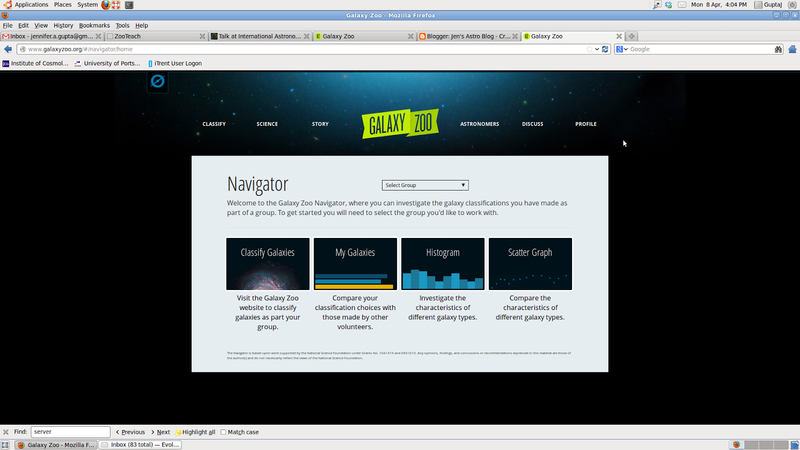 The above picture shows the home page of the Navigator tool. It’s pretty obvious from this picture what you can do with it! I quite like being able to compare my classifications with other people (see below), although as far as I can see it only shows your 12 most recent classifications and doesn’t go beyond your answer to the first question. 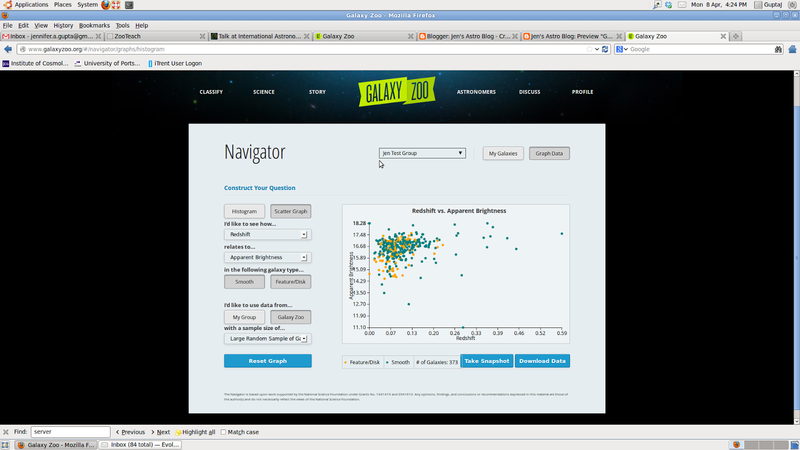 The most exciting part of Navigator for me is the ability to easily investigate your galaxies in more detail. There is the option to plot a histogram or a scatter graph and there are five parameters you can play with: redshift, colour, apparent brightness, absolute radius and absolute brightness. 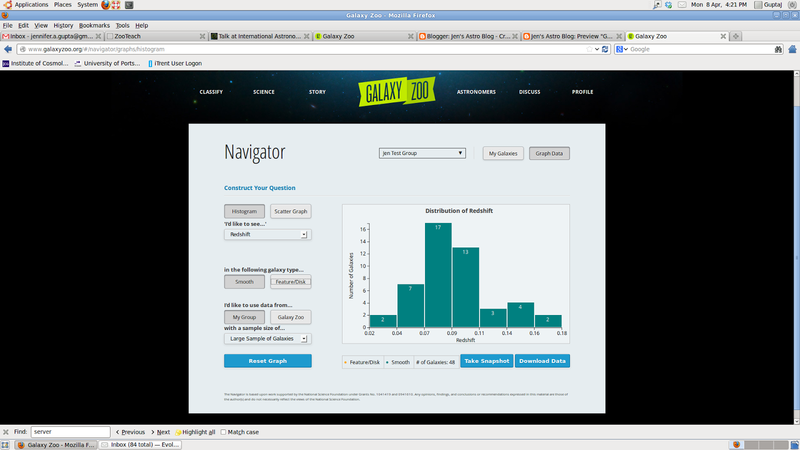 You then choose smooth or feature/disk galaxies, a small, medium or large sample size and whether you want to use your galaxies or a random selection of galaxies from Galaxy Zoo. You can also download the data if you want to make your own graphs. There are a few screenshots below showing examples of the different kinds of plots you can create but if you’re interested then I would recommend spending a bit of time on the Navigator yourself to get a feel for it. I personally think the Navigator is going to be really useful for schools outreach and I’m looking forward to trying it out with a group of students in a few weeks.